IT is one of Hampstead’s landmarks, an icon that has remained unchanged since it first opened its doors in 1953. But now regulars of the Coffee Cup – which boasts London’s oldest coffee lounge – are waiting with trepidation to see what a new owner will do to the café in Hampstead High Street. It is believed a well-known Hampstead Italian restaurateur has recently bought the Cup and now café regulars are sending him a message to say they want nothing more than a tweak to the menu, no changes to the staff and certainly no swanky make-over. The Cup has been graced by the great and good, the washed and unwashed of Hampstead since it opened. Peter Cook and Dudley Moore would nurse hangovers there, and Sir Paul McCartney, Betty Grable, Sting, Michael Foot and Jill Craigie, Emma Thompson and Tom Conti have all hung out in its wood-panelled lounge. Rex Cowan, a marine historian who has made his name hunting shipwrecks, first visited on the opening day. 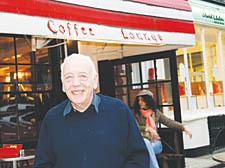 When the Cup was threatened with closure 10 years ago, he organised a petition that garnered 8,000 names. He believes the new owners have the chance to safeguard a piece of history. He added he wasn’t against all forms of change at the Cup, but said the interior – still as it was 50 years ago, with the exception of a bar being moved from one side of the room to the other – was one of the reasons it was held in such esteem by visitors. Regulars Sarah Tinn and Peter Woodthorpe discovered the Cup four years ago when they moved to Hampstead.